Bill Murray in my adult years is an actor who has impressed me a great deal. He has essentially taken the baton from Robin Williams, an actor who had greatly made my childhood that much more happy-filled and meaningful. 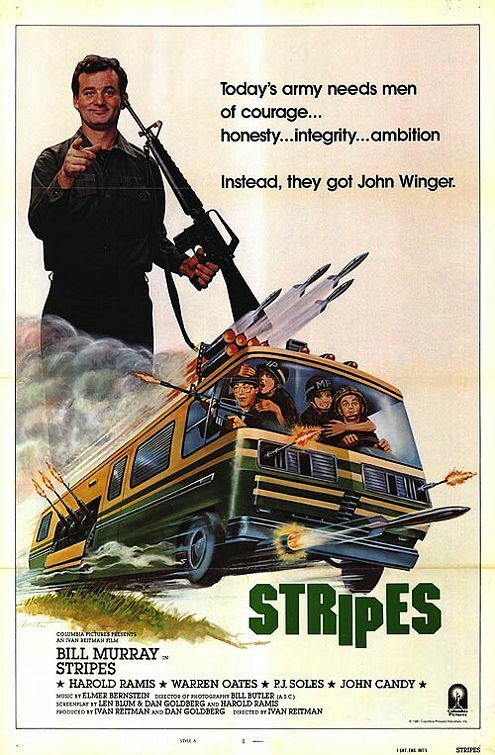 He was a key reason that I had decided to watch the American War Comedy picture from 1981-Stripes. It was a film that had made me much more interested to seek out his early films, which as of this moment, are at an abysmal two. The picture is very interesting, seeming as though it is directly spoofing, Full Metal Jacket. Though, this can only be observed in hindsight as the Stanley Kubrick Vietnam picture came out in 1987. But its existence within the era of the Cold War still makes it a provocative picture. It feels more like an amusing post-Vietnam film, seemingly showing the pitfalls with how random the draft was, and how young people fought in a crazy war. The time of which it exists, before some of the major 80s Vietnam pictures gives it a special resonance because it shows that the war was still prevalent in the American consciousness. At best, it takes shots at the army. Not only in its recruitment of the regular but disturbed schmoes but also in its leaders. One quite apparent example of this is in the character of Captain Stillman, who is played with a great blend of slimy, buffoonish smugness by John Larroquette. The best moments of the picture are some of the montages that depict the regiment getting trained. They are amusing and uplifting in equal measures, whilst still reminding the viewer of the hard worn, dedicated life which soldiers have. Bill Murray is fantastic as a man with a joke for every occasion. However, it is his early scenes that cast an impression, showcasing true vulnerability and fragility that manifests itself in impulsive actions and amusing words. The performance feels like a fascinating pre-cursor to some of his future work in which played truly lost and broken people. I was particularly thinking of the characters in Rushmore and Broken Flowers, when watching those beginning scenes. Finally, the composer Elmer Bernstein punctuates the film with an incredible score. It gives it a great identity of being a picture that relaxes and sees the virtues of the army in all its comical and patriotic glory.